Where on earth did Summer go? One day we were complaining about the sweltering heat, and then the next, er... well we're still complaining about the sweltering heat, only now, we're in September. So it shouldn't be much longer until we're complaining about the snow. Oh dear God I hope so. I can do snow. In fact, I enjoy snow. I do not, however, do heat. Heat and I have come to a mutual agreement that I'll stay out of it's way if it stays out of mine. 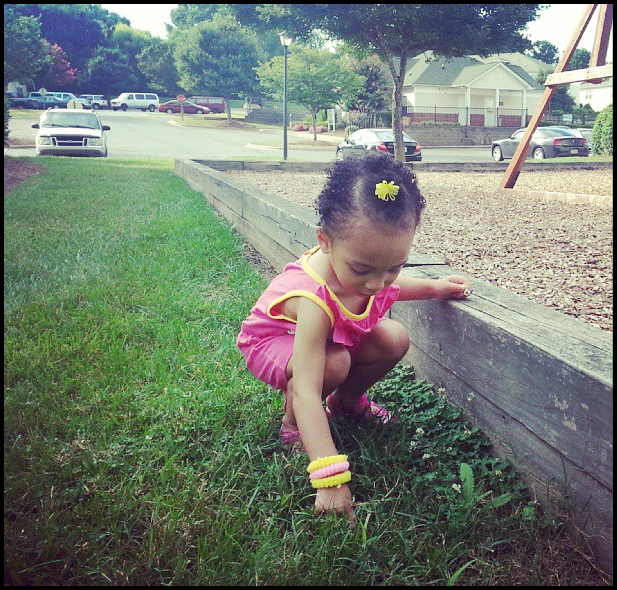 Which is a lot easier said than done when you have a two year old who practically lives at the park. But I digress. Our weekend was pretty uneventful. Unless you count the blowout we had on the way to the mountains. 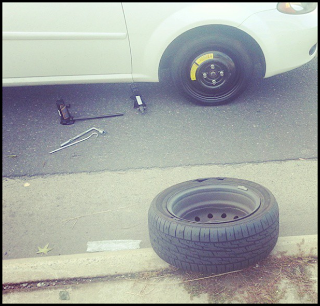 That's right, I lost another tire. Which, if you're keeping track, that's three of my tires that James has had the pleasure of replacing since we've been together. I am apparently, quite literally, hell on wheels. The best part about getting a flat in an area with relatively high traffic? Why the obnoxious hoots and hollers of the guys passing by of course. This time I managed to catch the attention of two cars back to back. Those squats must be starting to work. Despite the rough start, we decided to forge on to the mountains (after switching cars of course). Unfortunately our lovely trek was spoiled by the 70%+ humidity factor. Still, we managed to get in a heck of a calorie burning workout before we decided to call it quits. 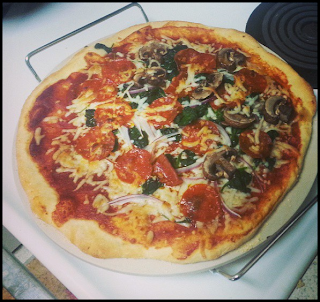 The bright spot of this weekend was finally having the opportunity to bake a homemade pizza. (Which I suppose was some unconscious decision to undo the calorie burning mountain workout). Moving on, I've wrestled back and forth with the idea of purchasing a pizza stone because we are rapidly running have run out of storage space in our kitchen, but the prospect of baking my own pizza eventually won me over. I didn't get a peep of disagreement from James or Jasmine so I guess I'm in the clear. For now. There's a lot to be said for actually making your own pizza. For one, you have complete control over your toppings. For instance, if you want to go heavy on the pepperoni you won't have to pay $3.00 per extra pepperoni. Then there's the added bonus of actually knowing what is going into you pizza. Of course if you take the lazy man's approach to making pizza (i.e. grand pizza crust and pre-made pizza sauce), you lose a bit of that control. But I still feel comfortable that our pizza was a bit more healthier than, say, Pizza Hut. So that was basically our weekend in a nutshell. What sorts of shenanigans did all of you get into this weekend? Also, stay tuned. Later tonight I'll be kicking off another fun little giveaway for you guys that I think you will all love. I can't stand Pizza Hut--but that pizza looks delicious! And that's too bad about the flat! Car trouble is one of those things that you never know just when it will flare up! I do love the taste and "fun" involved with making my own pizza but it is more time consuming. Have you ever done pizza on a grill?? It is AMAZING!!! Sorry about the tire--that really stinks! I still haven't gotten the chance to take the time and have a little fun making a homemade pizza. My sister made one a few weeks ago and it was delicious. I imagine that your pizza was just not good, especially with those toppings. The mountains sound like such a great idea. Visiting the mountains is definitely on my to-do list.